When your research moves into a new location, do you stop and learn about that area and the resources it has? Different states have different laws and sometimes different records or procedures. Urban research has challenges and opportunities that do not exist in rural settings. Research on the frontier is different that research in areas that were settled and populated. When a new location is encountered in your research, ask yourself “how is this place different from others places that I’ve researched?” There will be differences. Learning about them helps the researcher to avoid mistakes. 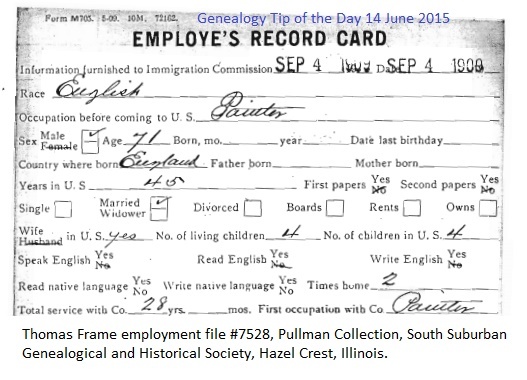 Are You Getting Genealogy Tip of the Day? We are still working through a few issues after our transfer to WordPress for our blog management. We appreciate everyone’s patience. If you get this message, and have a free moment, please let me know–either by responding on the blog, or to the email. I usually write about whatever strikes my interest and don’t pay much heed to what may generate a lot of chatter or responses. I try and write things that I think people will read and get some help from–and often those are things that people don’t respond to. So….gentle reader, if you could let me know that I’m not operating in a vacuum, I’d appreciate it. Now back to our regular programming! Have you checked to see if there are employment records for your ancestor? Virtually all of my ancestors were farmers, so there’s no “employment record.” However my children’s ancestor worked for the Pullman Car Company in Chicago and the image accompanying this post is part of his employment record. June is a busy time….we’re offering four new presentations this week. Join us! On my Rootdig blog, I recently mentioned that users of the free War of 1812 pensions at Fold3.com could help with that project in ways other than giving money. The pensions are only being indexed initially by name of pensioner and widow (if applicable). Users can create annotations for other names mentioned in pension files they use in their personal research, thus increasing the number of names that are indexed and searchable. An additional benefit of creating annotations is that it forces the researcher to read the entire pension file. And sometimes the best discoveries are made when a thorough reading of a record is done. Annotating a file may help you as well as helping someone else. 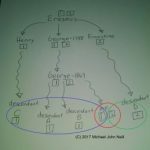 Your ancestor James Rucker cannot avoid a debt just because the person to whom he owes money has spelled his name as James Rucher. The legal concept of idem sonans is generally that if a wrong spelling sounds like the intended name, then it is the intended name. So if the bill at the garage says “Mike Neal,” I’m still probably liable for it. What Did A Death Do? The death of an ancestor can result in more than a death certificate, an obituary, a funeral, or an estate settlement. In some cases, the death of one parent can send an entire family into a financial tailspin, especially if the recently deceased parent was the sole provider for the family. Children may end up being farmed out to relatives or neighbors or have to quit school and go to work. Even in families where the children are grown the death of a parent can change the family dynamics. I think we have the email glitch solved–some subscribers were getting two copies of the daily tip. Thanks for your patience as we continue to work through a few last minute issues due to our move. When trying to correlate pieces of information remember that the simplest explanation is probably what happened. When deciding what to research next start with the most likely scenario. And remember that not all the details have to fit perfectly. Sometimes people can provide slightly different answers to questions on different records.